Welcome!!! Hope you're having a great start to your weekend. I am even though I'm up late. I have been working on something special for a contest that I'm planning on entering so we'll see how it goes with that. I am really pleased with the way it looks and I know someone really wants it in his classroom. I told him we will see if we can do that. I will be able to add on the way this is so would be interesting to see how this goes. I plan on adding as I get more to add to it. 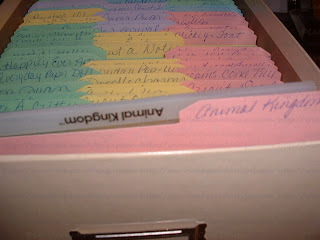 As I mentioned in the title that I have been working on a Cricut Overlay Organization project. This is using one of the standard photo boxes and the From My Kitchen Cricut Cartridge. 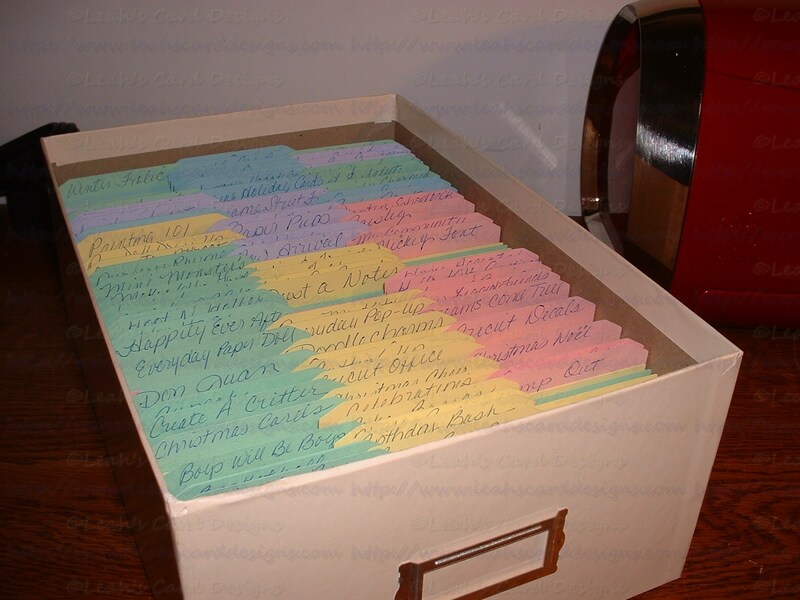 I used the recipe card with the tabs and cut them at 3.5 x 7.5" then it fits perfect and the tabs are great size for writing. 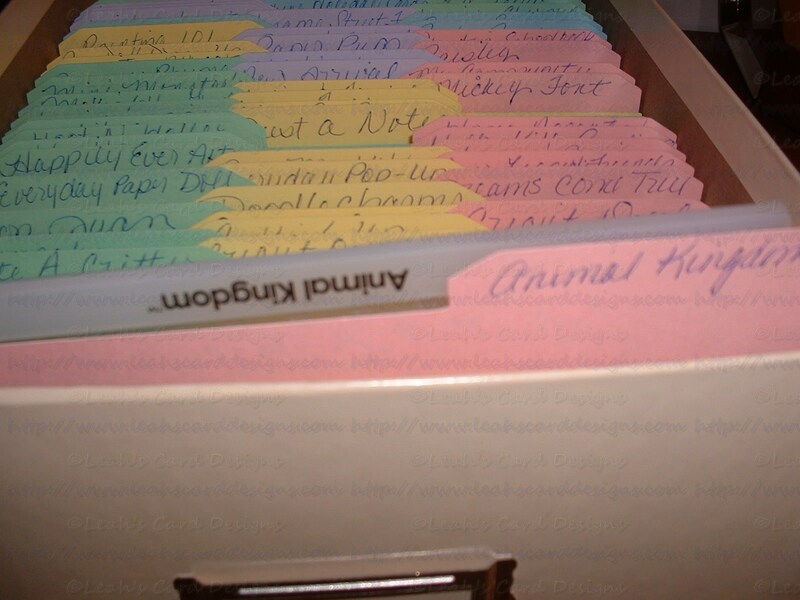 Now you might ask what if you get another one in between what you have that's okay, just add another file folder with the tab. You can also move some out of the box and put them into the next one when they get a little overfilled. I have a plastic storage box within my other photo box because I don't have enough overlays to fill the entire box. This works so they don't slide around or the tabs get messed up from the overlay's moving around. Thank you for taking a look. Here are the photos before I get going. Note in the second photograph that I placed the overlay upside down so the name of it was at the top. I did this because when you look at the tabs you still might question whether that overlay was in the front of it or behind. I thought this way there would be less confusion because you can see the tab, then the overlay is placed behind it in my case here. I am really enjoying this system. I have been showing Robbie more how to use the Cricut. I can tell you he really enjoys it very much. He loves what he creates and he is so gentle with the machine. I really love how he respects the machine and cares how he uses it. He is cautious and listens very well to what I tell him that he can and cannot or should not rather do with the machine. He just loves that he can do so much. I laugh sometimes because I hear him giggle then look and he's stuck something together then I can't figure it out what it is. He makes me play a guessing game. I think I may have to pull my jukebox down though so he can use it. He doesn't like to swap the cartridges out. I tend to use my Gypsy so I don't have to flip flop the cartridges. Although with this project I just used From My Kitchen so I didn't worry about using the Gypsy.